Following the Cambridge Analytica scandal, Facebook CEO Mark Zuckerberg and COO Sheryl Sandberg went on an apology spree, granting interviews to various television networks, news publications and online blogs, trying to pacify irate users and privacy advocates who have been adding fuel to the #DeleteFacebook fire. Now, the social networking company has taken out full-page ads in several major British and American newspapers, apologizing for the “breach of trust”. The ads appeared in the Sunday editions The Observer, The Sunday Times, Mail on Sunday, Sunday Mirror, Sunday Express and Sunday Telegraph in the UK, while in the US, The New York Times, The Washington Post, and The Wall Street Journal were among the papers that published the apology. 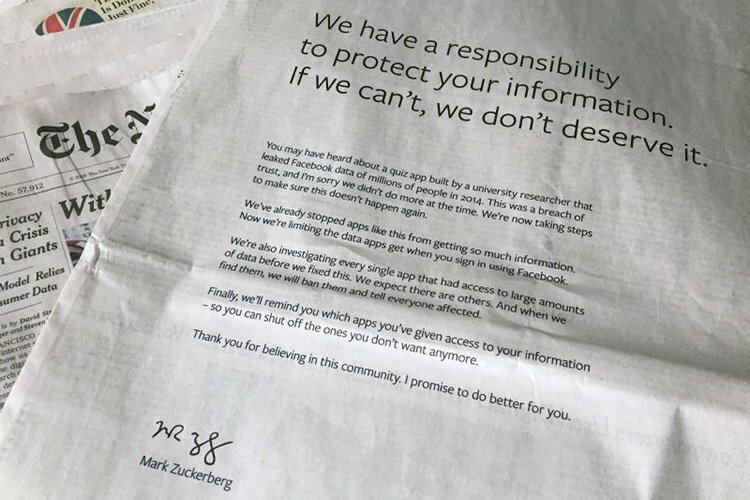 The ad was signed personally by Zuckerberg, who promised “to do better” in the future. However, there was no mention of the company at the center of the scandal – Cambridge Analytica. As part of the apology, Facebook said that it has already changed its data-collection policies following the controversy, and is reviewing “every single app” that accesses large amounts of user-data. The ad goes on to claim that it will ban all such apps from its platform that are found to be in violation of its stated policies, and promises not to withhold information from users if it found any other offenders. Following the revelations of Cambridge Analytica’s data-mining activities, Zuckerberg has been summoned by the House Energy and Commerce Committee in the US to testify in front the Congress, where he’ll likely be grilled about the controversial British company and its association with Facebook. Meanwhile, Cambridge Analytica itself is facing investigations in the UK, where around 20 officers from the country’s Information Commissioner’s Office raided the London headquarters of the company last Friday. The political consultancy firm is accused of illegally using Facebook data to manipulate the 2016 US Presidential elections, possibly, at the behest of Russian government agencies.